- This motorcycle was originally stopped on road 3 for not wearing helmet. - The lady became abusive and complained that she thinks one of the enforcers is laughing at her. 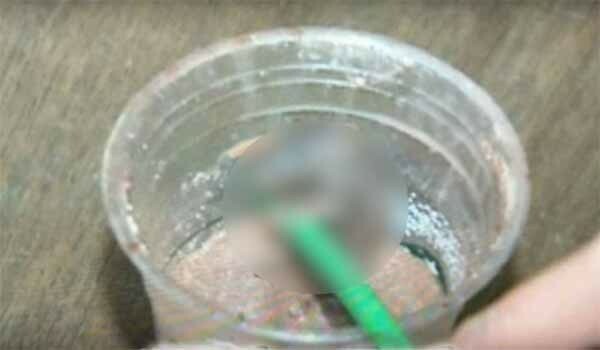 - They explained the complaints process to her and gave her the name of the enforcer that she thinks is laughing. - They issued a ticket and moved on, because she's cursing at them. There's no value in trying to talk with someone when they're acting like that. 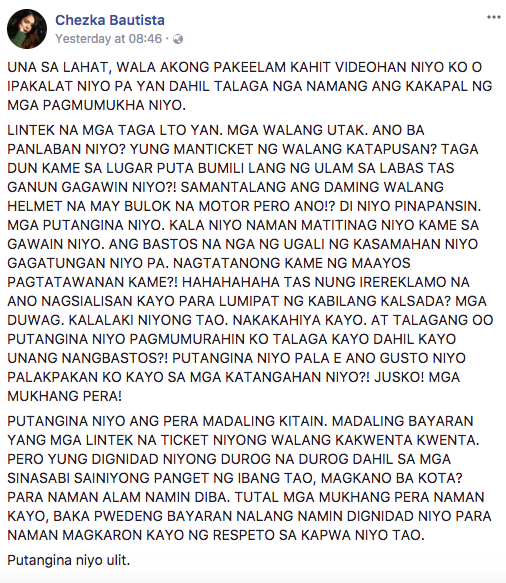 About 15 minutes after the first ticket, they came across the same motorbike on Visayas Avenue and noticed the girl still isn't wearing her helmet. 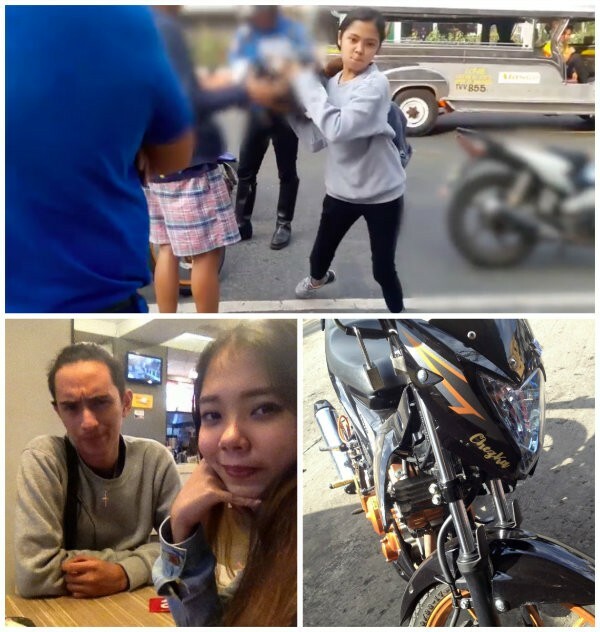 The lady and her beau being apprehended on the video were Chezka Nicole Bautista and Josh Caadan. On Chezka's Facebook account, she defended her side with series of Facebook status. Now you see how powerful social media is :) MINURA KO SILA. 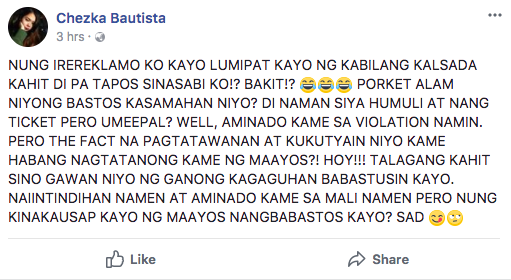 AMINADO AKO. BUT BEFOR YOU JUDGE. THINK ABOUT IT FIRST. KUNG PANO NILA KAMI BINASTOS. :) NO WORDS. DON'T BE ONE SIDED. 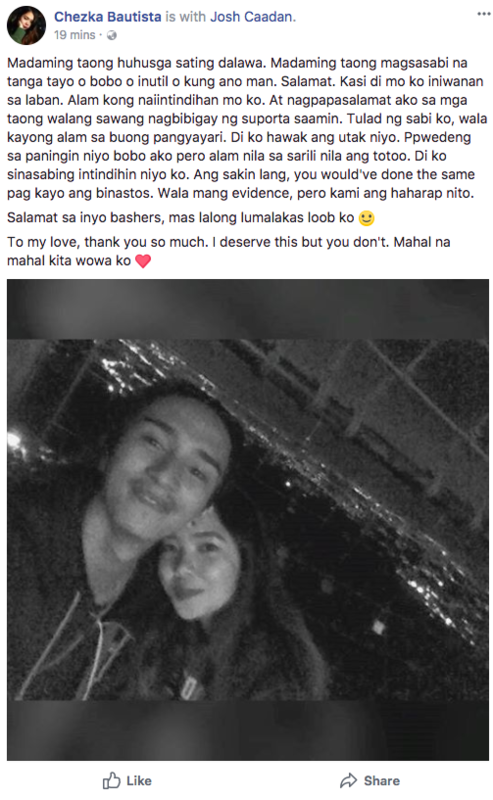 Chezka also posted a message addressed to her bashers and her beau, Josh Caadan. 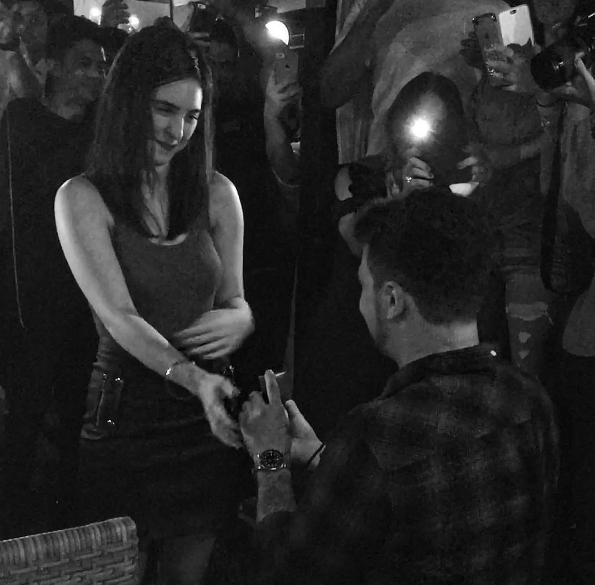 As of writing, the video has 102K shares and 5M views and counting. Who's at fault? There are always three sides of story and Pinoy Secret Files are open to hear MMDA and the couples side of story.